Last year I decided to experiment with decorating my sugar cookies with royal icing. Generally, I opt for buttercream icing because, hello? Buttercream?! This is a category that deserves its own food group. And royal icing, by comparison, tastes like dirt. 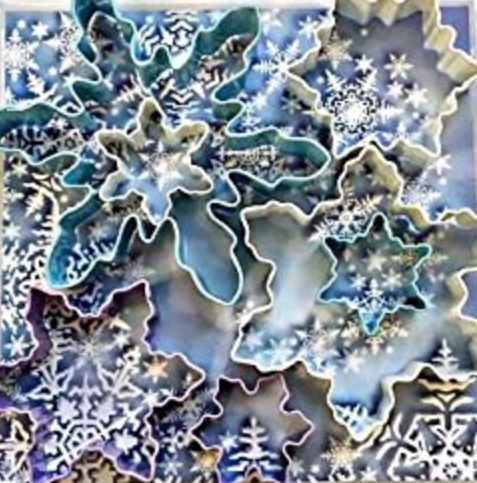 BUT that said, I wanted really pretty snowflake cookies, and for primo decorations that don’t smush when you arrange the cookies on a tray or package them for gifts, royal icing is the way to go. And these actually taste really good in spite of the lack of buttercream, good enough that there has been demand for them again this year…so the baking has begun! Cream together butter and sugar with a mixer. Add egg and vanilla extract and beat until blended. In a separate bowl, whisk together four, baking powder and salt. Add the flour mixture to the butter mixture and beat just until flour is incorporated. Gather the dough into a disk. At this point, the recipe says to wrap in plastic wrap and chill for an hour….then flour the counter and roll it out to a 1/8” to ¼” thickness. As Deb at Smitten Kitchen points out, this adds an hour to the recipe AND keeps adding flour every time you gather the scraps and reroll, changing the consistency of the dough. SO I followed her method instead: Place the dough between two sheets of parchment paper and roll it to the desired thickness, then put it, parchment and all, on a cookie sheet in the freezer for 15 minutes. Peel the parchment off each side and lay it back on one of the sheets to cut the cookies. The chilled dough will be firm and hold its shape more easily. Gather scraps and roll between parchment sheets again, cut and repeat until all the dough is used, return to the freezer for a few minutes if the dough gets too soft. Brilliant! Bake at 350’ for 10 minutes. Cool completely and decorate with royal icing. 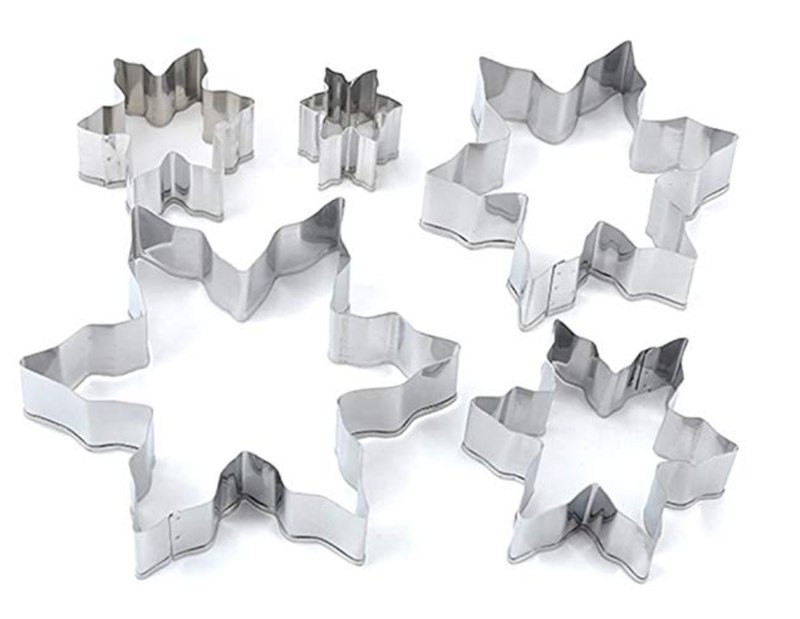 Clockwise: a 7 piece set w/ a variety of shapes, a 3 piece set with interior cutouts, an easy grip cookie cutter, and a 5 size set - these make excellent stocking stuffers for your favorite baker! Royal Icing is traditionally made with raw egg whites. I prefer to use meringue powder since it is easier and safer. Beat all ingredients 7-10 minutes in a mixer until stiff peaks form. Spoon into individual bowls and add coloring. I used blue for the flow icing, and a stiffer white for the piped design on top. *Add warm water, 1 tsp at a time until you reach the desired consistency – for flow icing these cookies, that is somewhere around the consistency of corn syrup or a little thicker. It should be thick enough to not drip off the edge of the cookie, but thin enough to fill in as you pipe. Start by piping an outline of icing, then fill in. Let dry completely. Add decorative piping on top for the detail. Once they are completely dry the icing will be hard enough that they can be packaged in pretty clear cellophane bags for gift giving or layered on a tray for serving! My first batch of snowflake cookies! I’m definitely not at bakery quality, but they still look pretty impressive, and taste great. They make a wonderful winter treat or hostess gift. And with enough practice, maybe I’ll be ready to tackle some new shapes and designs in time for Valentines Day?! Here are some pictures from some incredible baker/artists to inspire your cookie decorating!